Bridport is a small villiage in Dorset, in the south of England, just 1.5 miles from the English Channel. 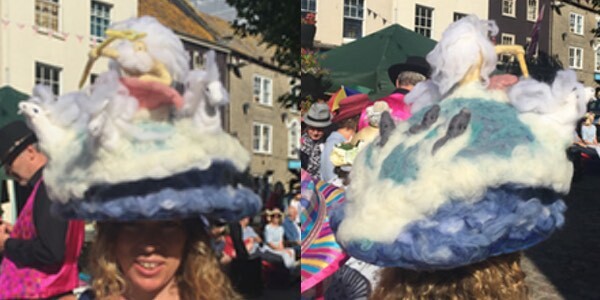 I had heard of the Bridport Hat Festival for several years and this year I finally entered images of a hat in the contest. I was delighted to have been shortlisted and sent in my hat for judging. I took the train/bus down from London on Friday afternoon in early September. If you can get a seat with a table, long train rides are perfect for finishing a hat and meeting nice people. There were hats in nearly every Bridport shop window and the charity shops had loads of hats for sale at great prices. Above are my favorite charity shop finds of the weekend, although I didn’t buy any of them. An eccentric grey hat by Pop Goes the Weasel, a lovely but far too small, white felt by Graham Smith for Fortnum & Mason. A Frederick Fox in a fawn with black ribbon & flower trim and another no-label hat with loads of stitching. From Bridport I enjoyed a walk that lead me by the river then through three fields, down to West Bay for the evening. (Images L-R, water mill by brewery-Bridport, Harbour West Bay, Dorset Coast – West Bay, Station Kitchen – West Bay). It was a gorgeous day and I savored a delicious dinner at the Station Kitchen. I appreciated a cozy night’s stay at a vegetarian B&B, The Old Mill House in Bridport. 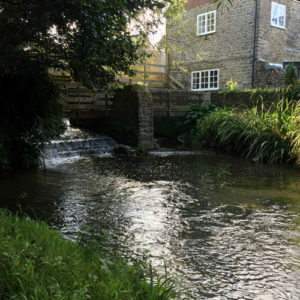 The Old Mill House was not much to look at from the street, but had gracious hosts and a small bridge over the river in their serene garden. The highlight is seeing the variety of hats. A lovely couple wore Twin Peaks, hemp hats from Kathmandu by Elephant Road, a couple in matching outfits, and my strip straw hat with wavy border and vintage flowers. I think this hat below, a hand felted scene of Poseidon/Neptune was stunning. Can you see the horses coming out of the sea foam on the left and sea creatures following behind on the right? 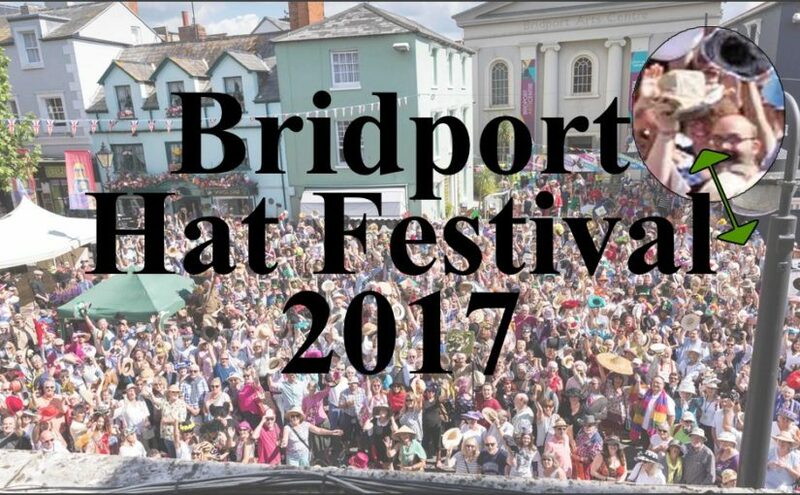 The Bridport Hat Festival is a fundraiser for various charities. One of which is Brain Tumour Research. They seem to be at a lot of the events I attend. I like collecting their annual hat designer badges. At one of the charity fundraising stands a gentleman was enjoying selling 2nd hand hats by coming up with some outrageous claims. 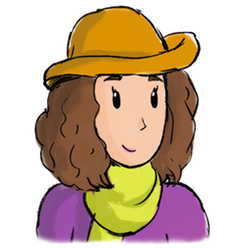 I bantered with him a few moments, then just as I was ready to decline and depart, I saw another unlabeled stitched beret, in gold and it fit me. If you’ve been following my blog posts, I have come across several of them in my adventures in Southern England. Who made these hats? The price was right and it came home with me. More crazy hats from jesters to lampshades. A couple who went with a breakfast theme of a skillet with bacon & eggs and a large fried egg. Hats with loads of stuff on them to a US political themed hat. Then in the vendors hall I spotted this little wire framed gem. I will be teaching a wire frame half hat class during London Hat Week in 2018, Cocktail Half Hat with Daisies. It also came home with me, as another sample of how versatile the wire frame technique is to make charming hats. The vendors hall featured several milliners and hat makers. Here are a few. From Left to Right. Fairytale Chic, Humphry Hats, International Feltmakers Association, and Hats-A-Head. I love all their creativity and craftsmanship. Finally, the catalyst for my journey the Milliners and Hatters Open Competition. The hats were on display all day in the Town Hall. At the end of the day the hall was cleared, then set with chairs with a center aisle. Each hat was modeled and awards were given. I didn’t bring home any prizes but it was fun to have my hat on display and then modeled at the end. The hat on the far right was the overall winner. I think they will eventually get photos of the hats on the Bridport Hat Festival website. My learning opportunity came when the hats were modeled. Despite having a center back mark and comb for placement, my hat ended up backwards and on the wrong side of the model’s head. Luckily it looked beautiful from all sides, but it really would have shown better if it had been worn properly. Live and learn, next time I’ll make it super obvious. Bridport was a lovely town and we had great weather. I think it would be a good place to take my family for a little holiday in the future. Thank you Bridport for a fun day out.